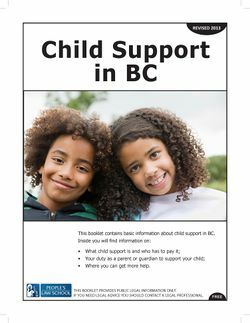 Child Support in BC from People's Law School contains basic information about child support in BC. Where you can get more help. What are child support agreements? · What is a child support order? · Which is better, an agreement or an order for child support? · What happens if we have an oral agreement for child support? How do I file an agreement in court? · Will the court review my agreement for child support? · What happens if I’m applying for a divorce? · How do I go to court for a child support order? · Which court should I go to? What is the amount of child support based on? · Do parents and stepparents have to pay the same amount? This page was last edited on 26 November 2014, at 14:55.